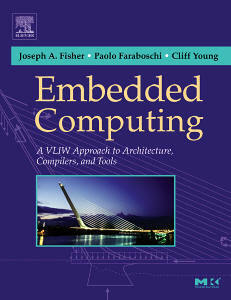 1.1 What is Embedded Computing? Controlling Area and Power Consumption. Simple integer and compare operations. Carry, Overflow and Other Flags. 7.1 What is important in an ILP Compiler? 7.3.3 Back end: machine-specific optimizations. The Modulo Reservation Table (MRT). The Allure of Embedded Java. Compiler pragmas and type annotations. Enable prefetching and exploit locality properties. Use look-up tables and memoization. Difficulty in characterizing the workload. Difficulty in writing retargetable tools.